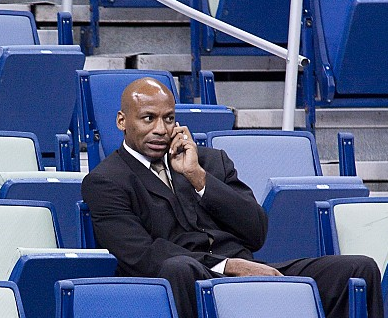 In a move that further solidifies the future of the New Orleans Hornets franchise, the team has signed General Manager Dell Demps to a multi-year contract extension. After head coach Monty Williams received his four-year contract extension back in August, the focus shifted to when Dell Demps would receive an extension of his own. Today, that wish became a reality, as the Hornets were able to come to terms with Demps in order to keep him in New Orleans for the foreseeable future. Per team policy, financial details and exact length of the deal are not yet available, but it would be reasonable to expect it to be something similar to Neil Olshey’s 3 year, $3.6 million contract to become GM of the Portland Trail Blazers. While it would be unfair to say that extending Demps was a unanimously favored decision, it is clear that the vast majority of Hornets supporters were impressed by his work as the team’s GM. As a result, news of this extension will largely be received in a very positive light, especially here at Hornets247. From the day he took the job back in July of 2010, Demps has arguably been one of the league’s most active and hard-working general managers, consistently finding ways to improve the roster. Throughout his tenure, he has consistently shown the ability to think multiple steps ahead, a characteristic that many other league GMs fail to exhibit. From all of us here at Hornets247 – congratulations, Dealer Dell, and keep up the great work! Pumped! Biggest signing since Anderson sign and trade! This is great news. Beside that original Chris Paul trade, Demps has done well. I’m definitely in favor of this, as I think he’s done a good job and is a good talent evaluator. However, the fact remains that it appears that one of his biggest decisions – matching Eric Gordon – could be a massive mistake. A Peja-level mistake that affects the ability to improve. Do we view this as an acceptable risk – we’re a small market team, and stars don’t line up to sign with small market teams, so you have to take a chance on one when you have them? Or should we be skeptical of retaining Demps in light of that move? As I said, I’m in favor of the extension, but I’m not 100% sure on it. Dell’s first huge mistake was agreeing to the Gordon trade. However, that mistake was basically forced upon him by David Stern. Dell’s second huge mistake was matching the Suns’ offer sheet for Eric Gordon, which was a complete disaster for the franchise. Here we only have Dell to blame. There’s a good chance that that trade might go down as the worst in franchise history. It’s brutal to watch Kevin Martin lighting up the Hornets while Gordon is sitting around somewhere, collecting his max pay checks and doing who knows what to rehab his knee. Still, Dell had some decent moves, like finding Ayon and Roberts. Draft wise, it’s still unclear how good Dell is. Davis shows a lot of promise, but we’ll see whether he is the best player in the draft. Darious Miller was a good pick in the 2nd round, but not sure about Rivers. I think he may be a solid player in the future, but he’s got a lot to learn and I doubt whether he deserved to be a lottery pick. Thought matching EG might tarnish the halo. Sure has for me. Great work in other areas though. Maybe it affected his affordability & competing offers. Probably not yet. But I bet people are watching it closely. The resolution of this Gordon thing, whatever it is, will likely be what defines Dell’s success running the Hornets. If Gordon eventually becomes a contributing piece, or is somehow spun into assets, then Dell will be considered among the cream of the GMs. But if the EG thing goes completely south, it will hang over everything else. No one gives Danny Ferry any credit for drafting Lebron, nor should they. Demps will be in the same place with AD. If Eric Gordon is good after bad and Austin Rivers doesn’t pan out- I bet Demps won’t make it through this extension. I want him to, but just sayin’. Result business. Good news. While I don’t think he’s King Midas, Demps has made a number of small-scale/productive moves over his tenure that have provided us with cap flexibility and a core of talented and young players to build around. If he’s not Midas then he’s pure gold baby!!!!! The problem of thinking several steps ahead all the time is forget the NOW. At some point the things need to leave the future and in fact happen. This history of looking to the future is very beautiful, but Demps needs to make moves to make the Hornets a winning team at some point. A team of the present, not the future. Great news! Although I am not sold on EG I am inclined to believe that Demps would allow the team or himself to be sucker punched by Eric Gordon and his agent. But overall I like Demps and Williams working together on the future of the Hornets. Plus I like Loomis when it comes to evaluating talent and he thinks highly of Demps. I cannot enjoy a GM who trades Marcus Thornton for Carl Landry and ends without both players after one year. And what do we have? Roger Mason, Xavier Henry, Lance Thomas? Where is our GM?? I’m glad you said “arguably” the best GM in the league because he gets (praised) for being mediocre. Who wouldn’t have drafted Anthony Davis No. 1? Jury is still out on Rivers. Also, all these little pieces won’t mean anything if Gordon isn’t healthy. And he never is.